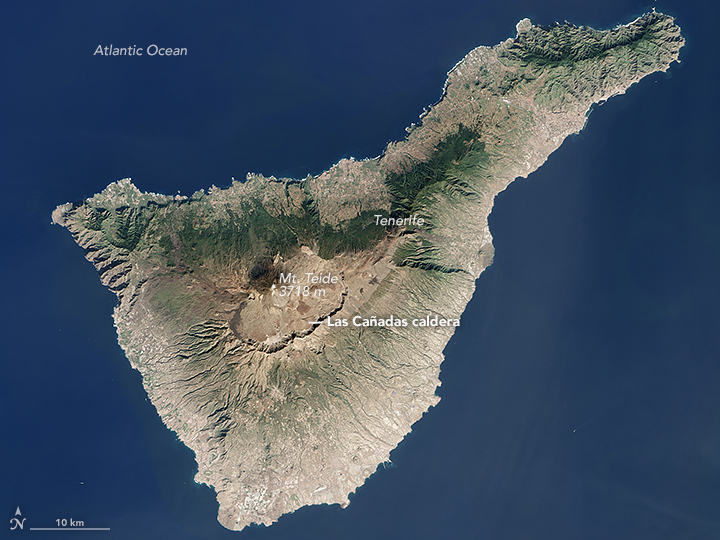 Detailed imagery can reveal components of the volcanism that helped shape Tenerife, the largest of Spain’s Canary Islands. But the wide view paints a more robust picture. The Operational Land Imager (OLI) on Landsat 8 acquired this image of Tenerife in its entirety on January 25, 2016. From summit to sea, you can see the transition between the caldera, the tree line, and the populated coastal areas. The summit of the Teide stratovolcano reaches 3,718 meters (12,198 feet) above sea level. But much of the volcano’s impressive height is unseen. If you include what’s below the water line, the volcano rises 7,500 meters (24,606 feet) from the ocean floor, making it the third tallest volcanic structure on Earth. About 190 square kilometers (73 square miles) of land around the summit are protected as part of Teide National Park. In 2007, the park was designated a UNESCO World Heritage site, joining Hawaii Volcanoes National Park as examples of the geologic processes responsible for building oceanic volcanoes. But the volcanoes of the Canary Island chain represent a different type of volcano building; unlike the Hawaiian Islands, these are slow-growing and produce a wide range of magma types. Surrounding Teide National Park is a band of green, which generally follows the boundary of Corona Forestal Nature Park. The green color is various types of vegetation, including stands of Canary Island Pine. These trees, native to the Canary Archipelago, have adapted to withstand dry summer months and to be resilient to fire. Closer to the shoreline, the patterns of civilization become more apparent. Santa Cruz de Tenerife is the island’s largest and most populous city, with more than 205,000 people. Carracedo, J.C. (2014, April 19) The Teide Volcano, Tenerife, Canary Islands. Landscapes and Landforms of Spain, (2014), 257–272. NASA Earth Observatory (2006, July 17) Tenerife Island, Spain. UNESCO (2016) Teide National Park. Accessed June 21, 2016.